Announcement Welcome to Keepsakes by Katherine where every day is a special occasion. Made to order bouquet lockets, bouquet charms, boutonniere accents, wedding memorial lockets and wedding keepsakes for your big day. I will help you with your finishing touches by combining creativity and imagination for your wedding or special occasion. It is a pleasure and a privilege to have you as a customer and to be entrusted with creating your keepsake. I do not take this responsibility lightly. It is with sincere humility and gratitude that I accept and appreciate your purchase. I ask you to please review my policies to ensure a positive shopping experience. If you live in the US please enjoy free shipping of your $100 or more order use coupon code FREESHIP2018. If you live outside of the US please use coupon code GET5OFF to receive $5 off any order of $100 or more. Happy customers are my best advertisement! Please consider leaving a 5-star review. Wedding day planning is exciting and exhausting. Keepsakes By Katherine has been referred to as the bride's good luck charm. Featured in Wedding magazine, Bride magazine and Confetti magazine and joyfully receives referrals from David's Bridal too. Most of the items in my shop are made to order and I always welcome your custom order. It is a pleasure to create for you. Welcome to Keepsakes by Katherine where every day is a special occasion. Made to order bouquet lockets, bouquet charms, boutonniere accents, wedding memorial lockets and wedding keepsakes for your big day. I was so happy with the turn around time and customer service. The order was filled right away and I received it well before I thought I would. Also it was beautiful! My daughter n law to be will absolutely love it to go on her bouquet!!! Thank you so very much!!! Locket arrived quickly and exactly as shown. Highly recommend! Boutonniere lockets and charms for the groom and groomsmen. I look forward to creating your keepsake, custom orders are encouraged. Previously named Shop PolkaDots a boutique shop with jewelry. But, after receiving quite a few handmade custom wedding orders I had a change in focus and Keepsakes by Katherine began. At Keepsakes by Katherine, I always keep your budget in mind. I encourage custom orders and you will find that most of my items are made to order allowing you to choose colors and styles. I make something for everyone who is getting married. If you are planning a wedding or planning on attending a wedding, I think you will find a perfect keepsake for the bride and groom. It is a privilege to be part of your celebration of love. I am excited to share that Keepsakes By Katherine has been featured in Bride magazine, Wedding Magazine, and Confetti Daydreams Magazine and Davids Bridal recommends Keepsakes by Katherine to their customers too. I use Swarovski pearls, and crystals, cubic zirconia, .925 sterling silver, 14K gold and other quality elements in my creations. Keepsakes By Katherine has been referred to as the bride's good luck charm. I take great pride in providing a positive shopping experience and I look forward to creating for you. I am an open minded and spiritual person, with a positive attitude and I greet each new day with gratitude. At Keepsakes by Katherine, I celebrate love not gender. Being entrusted with your wedding keepsake is a privelge. Dancer and seamstress extraordinaire! Packing shipping and all around helper. Hello, welcome, it is a pleasure and a privilege to have you as a customer and to be entrusted with the honor of creating your keepsake. I do not take this responsibility lightly. It is with sincere humility and gratitude that I accept and appreciate your purchase. Returned items MUST be returned packaged securely without wear or damage, in the same packaging as received. Insurance is recommended for all returns. Returns for orders fulfilled but customer changed their mind, or you don't want to pay your country's customs fee, will be charged a 50% restocking fee, this is not negotiable. SHIPPING COSTS are not refundable. BULK ORDERS are not refundable. VEILS, HAIR PINS, HAIR CLIPS, HAIR COMBS, ETC. are not refundable. GARTERS are not refundable. CUSTOM ORDERS are not refundable. HOLIDAY AND SEASONAL items are not refundable. SALE AND CLEARANCE items are not refundable. By purchasing from Keepsakes By Katherine the buyer has agreed to all listed terms and policies. PayPal is a secure site and a trusted name for buyers and sellers for many years. You do not need to be a member of PayPal to use it. I will not ship until verification of payment has been received. Keepsakes By Katherine reserves the right to decline purchases by anyone with a history of negative feedback and/or malicious behavior towards members of Etsy or other selling sites. Please make sure my keepsakesbykatherine [!at] gmail.com is in your approved list or contacts. Happy customers are my best advertisement. I hope you will take a moment after receiving your order to leave a positive review of your purchase. I strive for a five-star rating every time. PLEASE remember this is my livelihood and anything negative hurts not only my business but my opportunities to grow. Reviews are so important. Kindly refrain from posting a negative review. Please contact me and allow me the opportunity to correct whatever you don’t like. I will always rectify the situation to provide a positive outcome. Customer satisfaction, five-star service is always my goal. I am very easy to work with, so please, be kind and know that any issue is certainly not intentional, and I will do everything I can to make it a five-star experience from order to delivery. HOW BIG IS THE BOUQUET IN THE PHOTO AND DO YOU SELL THEM? I don’t sell them, but there are some lovely shops on Etsy that do. The bouquet in my display photo is approximately 8 inches long (from top of flowers to bottom of handle) and the flowers are approximately 6 inches in diameter. The handle is 4.5 inches long and 1 inch in diameter. The bouquet is not included. I NEED THREE LOCKETS, BUT YOU ONLY HAVE TWO AVAILABLE, CAN I GET MORE? Yes, I can usually make more for you. Please contact me I also welcome your custom orders. DO YOU SHIP TO EVERY COUNTRY? I can’t ship to every country but I do ship to many of them. If you don’t see your country on the list please contact me and I’ll see if I can do it for you. CANCELLATIONS- will be accepted if the item has not shipped yet and it is not a custom order. Once your return is received and inspected, I will send you an email to notify you that I have received your returned item. I will also notify you of the approval or rejection of your refund. If you are approved, then your refund will be processed, and a credit will be applied to your credit card or original method of payment. Some banking institutions can take up to 30 days for your credit to appear. However, this is rare and most process in 7-14 business days. Late or missing refunds (if applicable)-If you haven’t received an approved refund yet, first check your bank account again. Then contact your credit card company, it may take some time before your refund is officially posted. Next contact your bank. There is often some processing time before a refund is posted as noted above. If you’ve done all of this and you still have not received your refund yet please contact me. Keepsakes By Katherine registers its copyrights with the United States Library Of Congress-all rights reserved. 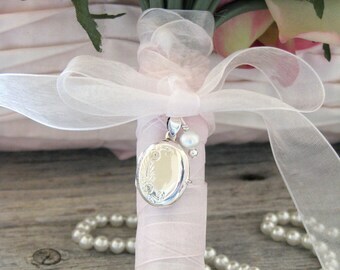 LOCKETS-All lockets are lightweight, so they will not pull on the bouquet when attached. A template is included with every locket- the template is meant as a guide and does not fit exactly, you will need to trim and size accordingly. There is a lip inside every locket where the photo is held in. The photo frame charms have a clear plastic sleeve that you insert in a slit at the top of the frame with the photo/photos inside. 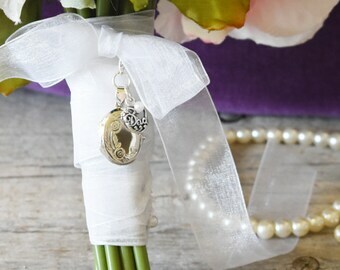 All bouquet charms and lockets come with a pearl ended pin, a lobster clasp attached and 30 inches or sheer organza ribbon. 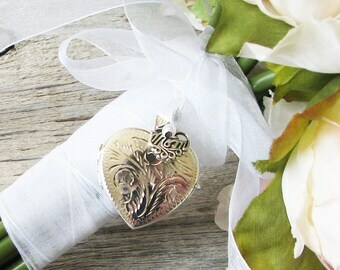 Providing plenty of options for attaching to your bouquet, if you would like a print out of ways to attach your bouquet locket please let me know I am happy to email it to you. In addition, I have a printout for placing the photo inside your locket too. Just one more reminder-Buyer is responsible for customs, duties or other shipping fees. PHOTO ALTERATIONS, PHOTO SIZING- this option is available for locket purchases from my shops. I will shrink a copy of the photo you send me to work with the locket you are purchasing. I may alter the photo to remove marks, creases, photo flaws, background distractions, etc. if needed. I will crop the photo to show only the person you request. I may use the background in the photo may replace the background with a white background or background color that matches the existing background. I will send you a proof sheet. After proof approval, you will receive an emailed locket template containing your altered photo in a document format. Please send the photo to the email account I use to acknowledge your order. Please, note-Some distortion may occur when the image is minimized to fit the locket template. But I will do my best to avoid this. I am sorry, but I do not provide a makeover service for the photos. I do simple retouching, cropping and sizing where it is possible. Older photos may appear grainy (pixelated). 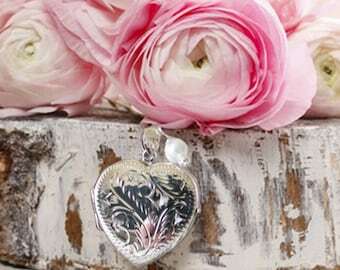 I’m sorry I do not place the photos in the locket for you. ORDER CONFIRMATION-You will receive a confirmation email from Etsy and Keepsakes By Katherine. If I have any questions I will include them with your order confirmation email. Please take a moment to add keepsakesbykatherine [!at] gmail.com to your contacts address list. To keep confirmations, questions etc. from going into your bulk mail. TYPOGRAPHICAL ERRORS-In the event that an item in my shop is mistakenly listed at an incorrect price or description, I reserve the right to refuse or cancel any order placed for the product listed incorrectly. I reserve the right to refuse or cancel any such orders whether or not the order has been confirmed and payment has been received. I will issue a refund or in the case of an incorrect price listing I will request an additional payment for the difference before shipping. CARING FOR YOUR SILVER PURCHASE-Help prevent tarnishing by storing your silver lockets and jewelry in a cool, dry place. Moisture in the air causes silver to tarnish. If necessary you may want to invest in a silver polishing cloth.